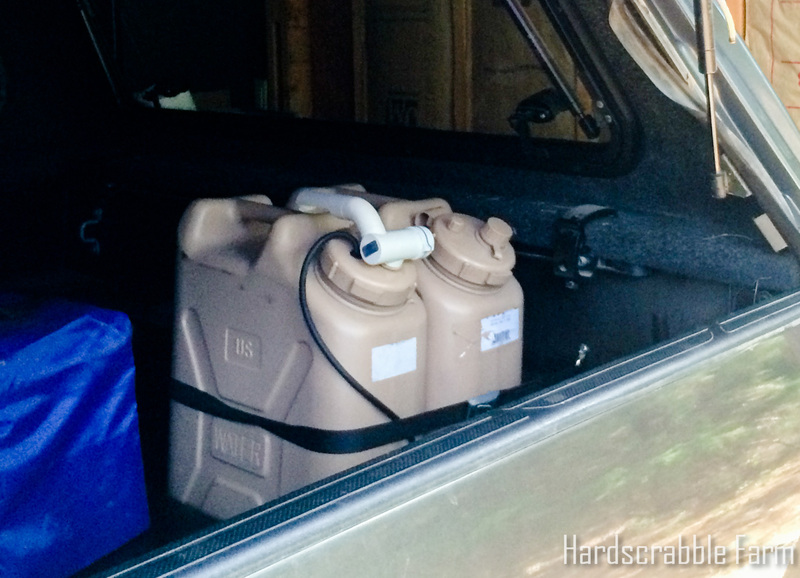 A couple years ago, Robin & I had played with the idea of going camping in our 1971 Land Rover 109. 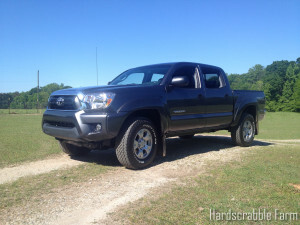 Unfortunately, it was not exactly the most dependable vehicle for long trips. One night I was reading posts on a Facebook Tennessee Land Rover Enthusiasts Group & stumbled across Expedition Overland.’s Alaska/Yukon Expedition. This was an awakening for us both! We had no idea there was an entire community of people already doing exactly what we wanted to do! Vehicle based exploration. It seemed to be the perfect combination of many of our hobbies from over the years: road trips, camping, orienteering, combined with all the fun parts of reenacting! 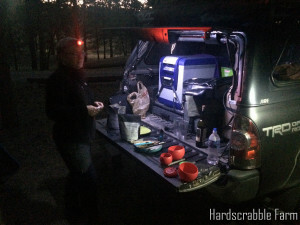 After this initial introduction to Overlanding, we started to piece together more resources about the hobby. One of the greatest places to find out about routes, vehicle builds, and more is Expedition Portal Forums. A couple months after this discovery, a friend’s brother was involved in a horrible accident where a drunk driver crossed over the center of the road & hit him head on. This got us thinking about the safety of our Mini Cooper. A bit of research, talks with friends who owned Tacomas, and some shopping led us to our 2014 Toyota Tacoma TRD Off Road truck. We wanted to make sure all our modifications were well thought out, so we decided to take it slowly. 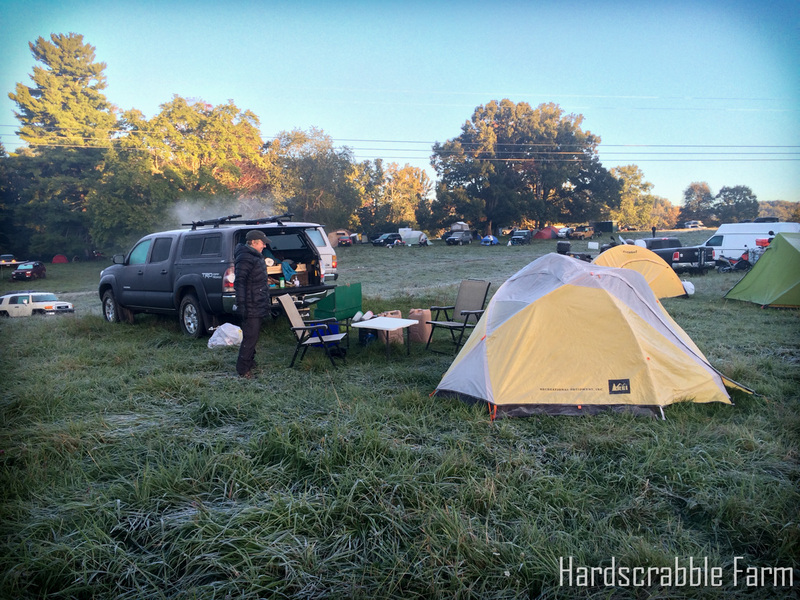 We started digging out all our old camping gear & going to Overland Expo East in October of 2014. This was a great way to get started. Tons of classes, vendors, and experienced overlanders to talk with. You can tell we were high speed! ;^) REI dome tent, 1960’s coleman stove, army mermite can as our cooler, and standard camping stuff. 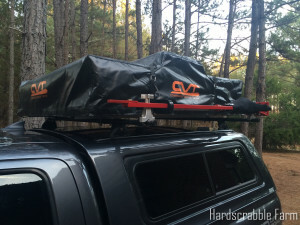 So, you don’t need fancy kit to have fun overlanding. But we did want to be more comfortable. Over the last year, we’ve added quite a bit to the truck, but we’ve added it slowly in hopes that we don’t make any costly equipment mistakes. One thing we definitely knew…. we wanted a truck cap to protect our stuff from the weather and from sticky fingers. 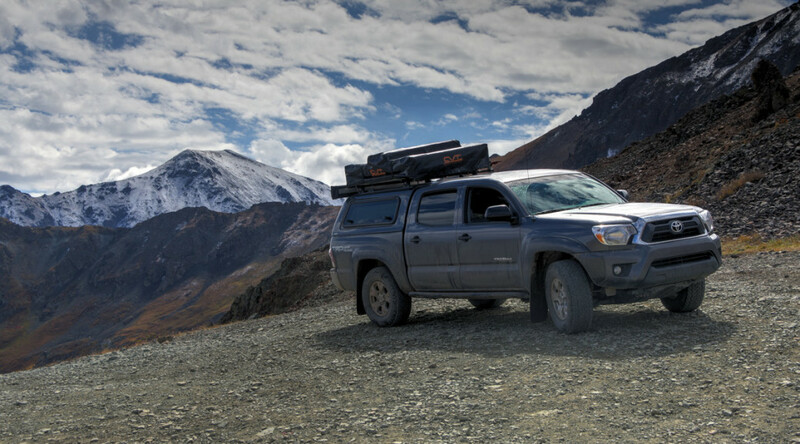 We saw that Expedition Overland had good success with the ARE truck cap on their Tacoma during their trip to Alaska and the Yukon. They chose the CX series, and we went with the X series. The X series has a frameless glass back window (ok there is a frame, but externally it looks frameless) as opposed to the more tradition aluminum frame of the CX series. You can choose what style window you want on each side. We went with the sliding window on the drivers side. That way we can vent the truck bed on the hot summer days here in Georgia. We opted for the win/door on the passenger side. The nice thing about that is, we can open the win/door and access the front of the bed of the truck. 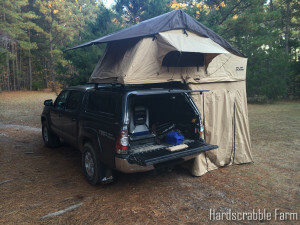 This works even with the rooftop tent deployed…so you can rummage in your stuff without getting rained on! One thing that I wish we had realized… the CX rear door opens up much higher than the X series. This is both good and bad. Good: the rear door does not interfere with our rear mounted awning. Bad: this 6’3″ tall guy periodically impales his head on the door latch. We fixed this problem by making an EVA foam cover for the latch. The foam cover also incorporates an 8″ LED strip from the auto parts store. So, the cover is both brain protection and lighting! Win! Off road protection is not cheap, but in terms of insurance against future damage, it’s invaluable! We decided that protecting our investment would be the first step of our build. Freshly painted All-Pro Off Road Rock Sliders. Again, our visit to Overland Expo East helped us out on our build. We took a class on dual battery systems. That was a good primer. Then I scoured the build albums on the Expedition Portal Forums. We ended up with a pretty basic, but (in my opinion) quality build. We went with the National Luna Dual Battery Kit. It was pretty comprehensive. I did have to buy a few battery lugs, etc, but the big stuff was all there. 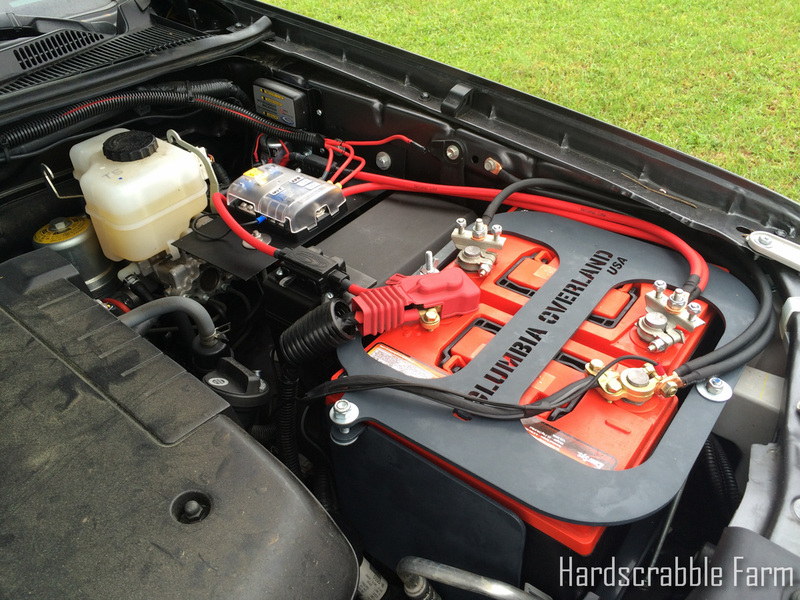 The dual battery tray came from Columbia Overland. It was the only option that used the original battery location, without having to cut or trip anything. Power distribution (aka fuse block) was handled by a Blue Sea Systems 6 fuse block. We ran three circuits to the back, plus an extra in case we expand our electronics needs. There is an accessory plug in the driver’s side bed cubby for the ARB fridge. USB and 12V accessory plug powered off 2nd battery. There is also a Blue Sea Systems dual USB outlet and accessory plug on the right side of the bed. Those power any accessories we use, including the faucet in the jerry can. The National Luna Dual Battery Controller has a handy gauge for monitoring your battery levels. 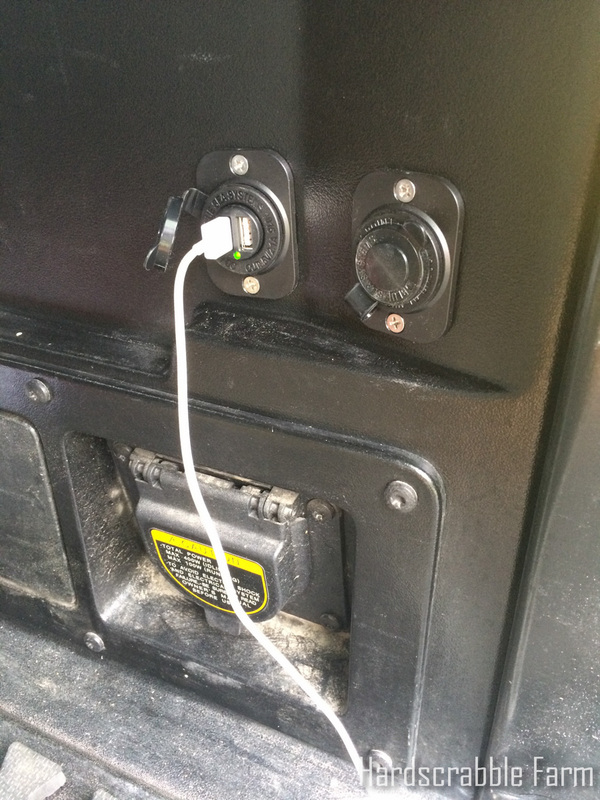 You can also press the lower right button (marked “ON”) to use both batteries to power a winch…or to self-jump start the truck. 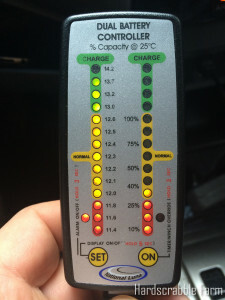 National Luna Dual Battery Controller. 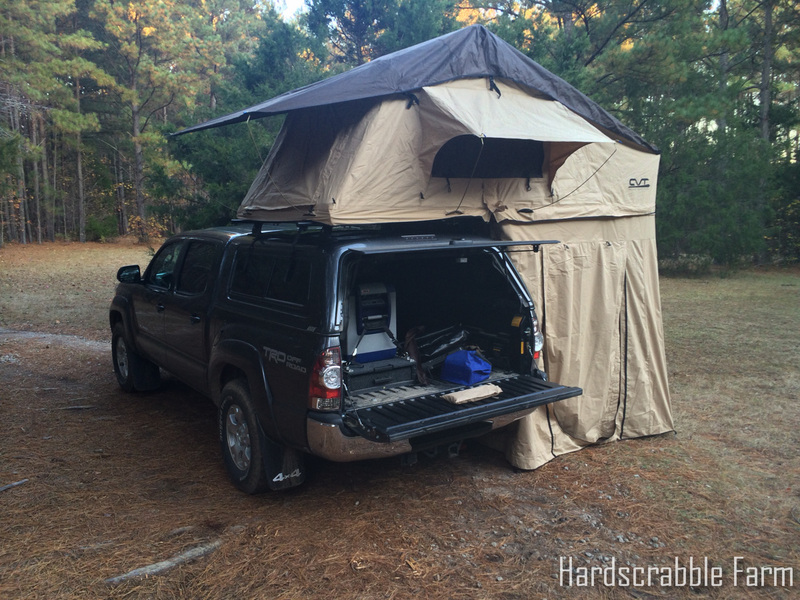 After talking with everyone at Overland Expo East, we opted for a Cascadia Vehicle Tents rooftop tent. It’s AWESOME. We slept in it for 7 nights in Colorado. We slept soundly every night. It was just as comfortable as a bed…and more comfortable than many beds! Since we don’t have a fancy bumper with a spot for the High Lift Jack, we mounted that on the roof rack, next to the tent. The only downside is, if we want to use the driver’s side window, we have to dismount the jack so we can install the awning supports. No big deal, it only takes a couple minutes when we set up & take down camp. High Lift Jack mounted on roof rack. Food! A HUGE part of any campout. We took this slowly, because we wanted to make sure it was a useful setup. Last Christmas, we went on a camping trip to Florida. We didn’t have the dual battery set up yet, so we used a cooler instead of the ARB fridge. 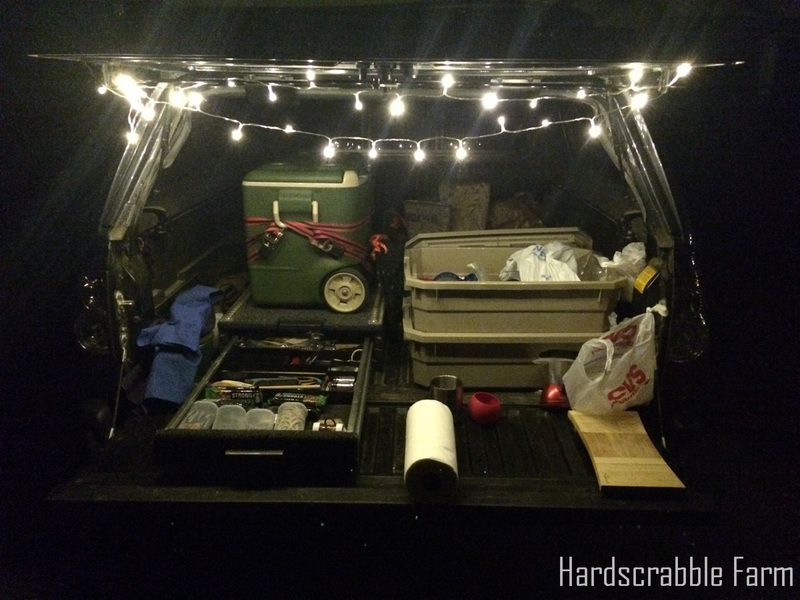 Camping with a cooler and Christmas lights. We also used strings of Christmas lights to illuminate our kitchen. The storage bins were opaque. Practical, but hard to know what’s in each bin. 2 Jerry Cans, one for washing, one for shower water. Another addition to the galley is two USGI water cans. They are secured to the side of the bed using two footman loops and a web strap. The one of the left has an electric faucet, the other is water for our portable shower cube! 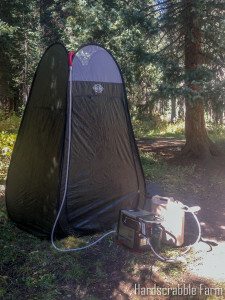 We discovered the Water System in a Can from a review on Expedition Portal. Camp shower….best thing since sliced bread! It’s wonderful being able to take a nice warm shower….much better than the weekends without showers when we were reenacting! 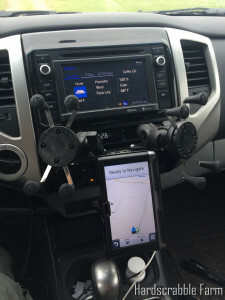 We’ll be using our iPhones or a Garmin GPS for most road navigation. For off road navigation & emergency calls, we’ll use our DeLorme inReach. These are all held securely on the Ram mounts attached to the Tacoma Tech Deck. So that pretty much covers our truck so far. I’m sure I could go into more detail, but then I’d risk really boring you! As I already mentioned, we’re going to replace the plastic totes with a Outback Solutions drawer. We seemed to spend the majority of our time at camp trying to dig thru the various bins. This should make our truck a lot more organized. 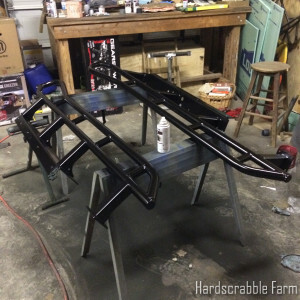 We also want to add a little bit of lift to the truck. Maybe 2″-3″. 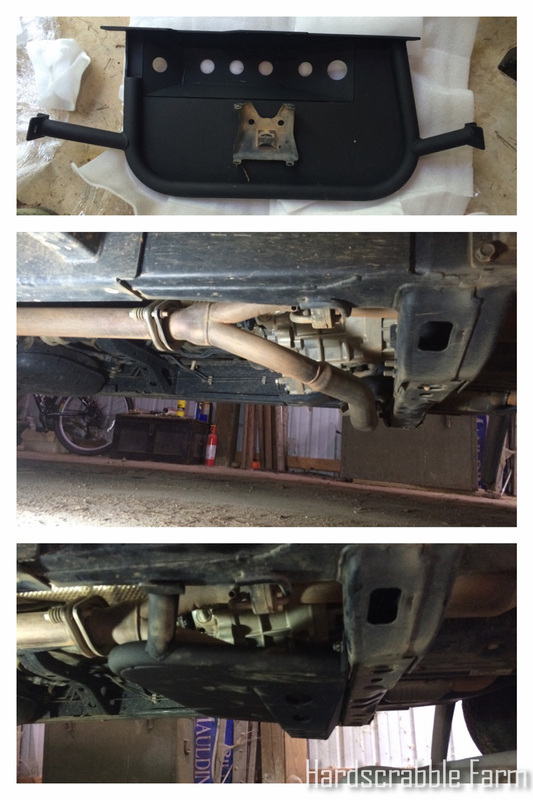 We hit the transfer case skid plate a bit more often than I’d like. Having a bit more lift will also make it easier for me (Brian) to stand under the tent overhand & truck bed topper door.